Product #21467 | SKU F8J088BT | 0.0 (no ratings yet) Thanks for your rating! 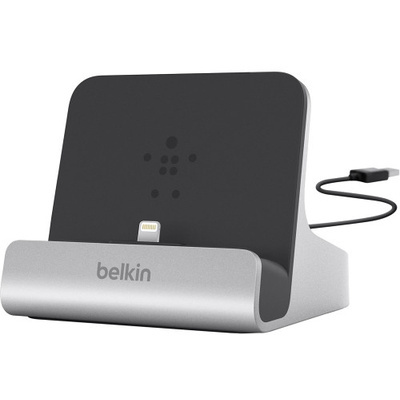 The Express Dock for iPad with Built-In 4' USB Cable from Belkin offers a convenient, compact way to keep your iPad (4th generation), iPad mini, iPhone 5, or iPod touch (5th generation) upright while charging and syncing. The iPad docking station allows you to comfortably watch video or surf the web while charging your device's battery. This iPad docking station features a built-in 4' USB cable, so you can connect it to your laptop to easily charge and sync your Apple device. Connect the cable to your own power source, and you can charge (but not sync) via any power outlet.